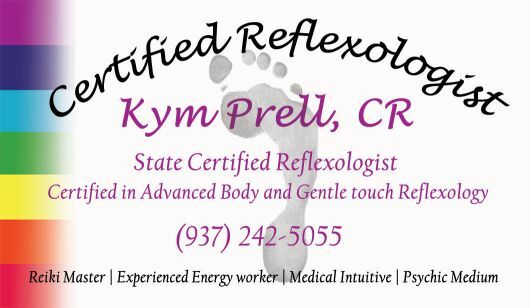 Kym Prell is a State Certified Reflexologist, certified in Advanced body reflexology, and gentle touch reflexology. She is also an experienced energy worker, medical intuitive, and psychic medium, Reiki Master, and mother of 5 amazing children. Through the last 10 years of her journey she has had the honor of learning from various elders and teachers, which each have added a little bit to of who she is today, and the various healing modalities she has been honored share with so may others. Along with creating the lavender farm with her husband and children, she has been working with the healing energy of essential oils and making products for body mind and spirit balance for the last 10 years. Kym selects, blends and makes by hand all of the products that we make here at Peaceful Acres. The energy and passion she has to help people is put directly into the products that she makes. All sessions are $60 for an hour / $35 for a half hour. connection to a higher state of consciousness. 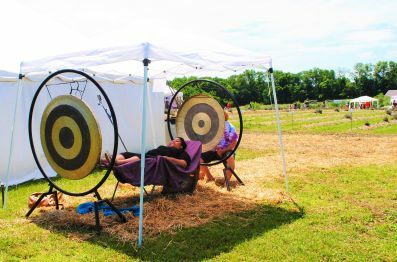 The gong provides instant relaxation, stress relief,stimulation of the glandular system, and serves as a facilitator to break up emotional, physiological and spiritual blockages and an amazing portal to begin or continue your journey of transformation. As living beings, we are constantly being vibrated, on a cellular level, by heard and unheard sound frequencies. Allowing the vibration of the gong to connect with your inner vibration, you access ancient healing wisdom passed down through the handmade wisdom in the gongs. At Peaceful Acres, we have 2 subatomic gongs. Individual sessions require you to lay on a zero gravity chair as the vibration is gently played from your head and your feet. Group sessions are also available, and this can be added to any session or workshop you attend here at the farm. Average sessions are around 3 minutes long and cost $5. bodies own healing potential in order to relieve pain, ease tension, create deep relaxation, and release toxins. It feels like a wonderful foot massage but is so much more. Using a map on the feet and hands, gentle and deep pressure is used to locate and ease imbalances within the body. Kym’s style of Reflexology has taken on many of the techniques she acquired in her Gentle Touch Reflexology training, which is a very energetic approach, leaving your feet feeling like you are walking on air. She also works with Chakra and Energy Balancing , which is a way of working with the energy just around the physical body, to bring balance, relaxation and guidance. Many physical problems begin with an energetic imbalance. Through working with the vital energy system of the body, she utilizes her Reiki training, color and sound vibration, or gong meditation, and her intuitive gifts to assist your body in your own healing potential. Each reading is very individualized. Kym uses her intuitive gifts by feeling the energy centers of your body. As she works within your energy field, she asks for the assistance of any of your spirit guides, passed loved ones and animal guides. Tapping into the divine flow of universal energy give you and her access to the beauty of where we came from and where we will all return. When asking assistance from anyone there for you in this journey, usually many wonderful messages will come through which can greatly help you access your own unique gifts, and path in this life. You can come to a reading with the intention of connecting to a certain person who has passed, or just a general seeking to truly connect to the parts of you that you may have forgotten. Many times through sessions she is able to release any old energetic negatives, or physical body imbalances which may be keeping you from living your life to its fullest potential. Kym's gifts as a medium were fine tuned through her mother in laws passing in 2014, as she worked with her from the other side to gain a better understanding of the power of simple confirmation that there is more to life than what we can see. This part of her work has allowed her to make the connection for many others to get messages to and from the other side. Creating peace, assurance and clarity, this has given her greater purpose than anything she has ever experienced, besides bringing her 4 children into the world. It is her honor to share her gifts with you.